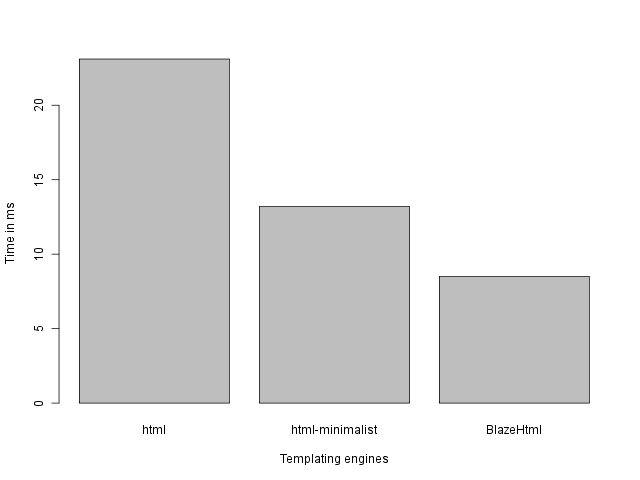 This is a blogpost version of a talk I recently gave at the DutchHUG, about BlazeHtml, a “blazingly fast HTML combinator library”. This project was accepted for Google Summer of Code, so I thought I’d blog it, too. About one month ago, a discussion took place on the Haskell web-devel mailing list. In the mail I link too, Chris Eidhof describes what he wants to see in the Haskell web-devel neighbourhood. Not much later, a ticket is created for Google Summer of Code by Johan Tibbel. I was quite interested in this idea from the start, so because I was attending ZuriHac, I started a project on GitHub to do some work in this direction. 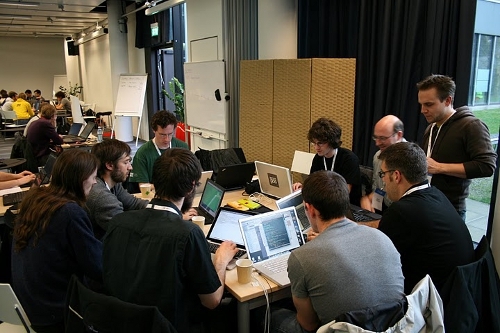 This project turned out to be more popular on ZuriHac than I had initially expected – I got the help from 7 awesome Haskellers: Chris Done, Fred Ross, Jim Whitehead, Harald Holtmann, Oliver Mueller, Simon Meier and Tom Harper. Together, we produced an initial, prototype version of BlazeHtml. We focused on abstraction as well as performance… and I’m afraid we wanted to do too much at once. With pain in my heart, I had to throw a lot of code away and make a fresh start after ZuriHac. But this does not mean the code we wrote was not useful: I will reintegrate big parts of it later, and it was a very useful learning experience. Let’s define the actual problem more precisely. We want to write abstract descriptions of Html documents built from content and atttributes represented both as String as well as Data.Text values, since both types are common representations of sequences of Unicode characters in Haskell programs. We want to render these documents to a sequence of bytes represented as a lazy ByteString. The chunks of such a lazy ByteString should be “big enough” in order to be efficient in later progressing, like sending the render over a socket or writing it to a file. We first want to get a performance baseline. This way we can precisely determine what later abstractions cost. UTF-8 supports Unicode and is widely used and recommended for web pages. So, what is the current state of our library? After having tried different design paths, we now have an implementation that is fast. With this baseline performance, I hope to continue. The question, of course, is how fast it exactly is. 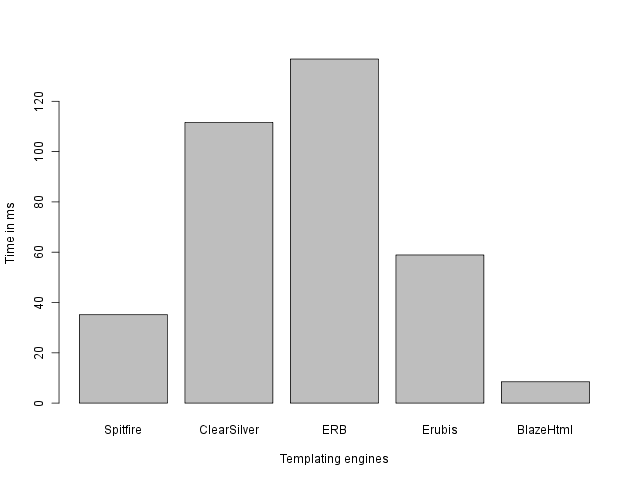 The “Big Table” benchmark is a very simple microbenchmark, implemented in many different templating engines. It times the rendering of a big <table>. This table has 1000 rows and 10 columns, and every row has the simple content 1, 2, 3, … 10. Although I have to say that this comparison is not quite fair. BlazeHtml produces encoded strings, where the other packages produce just strings (which still need to be encoded before sending them over the network). The code used for these benchmarks can be found in our repo. Some benchmarks were implemented by the spitfire team, they can be found in their repo. I edited some of these benchmark so that all of them escape the table content, in order to make a more fair comparison. We avoid explicit intermediate data structures by using a continuation-passing style; i.e. our only intermediate data structures are closures, which are probably the best optimized data structures in a functional programming language like Haskell. We copy each output byte at most once by using a mutable buffer encapsulated in a Builder monoid. -- | /O(n)./ A Builder from a raw write to a pointer. fromUnsafeWrite :: Int                  -- ^ Number of bytes to be written. -> (Ptr Word8 -> IO ()) -- ^ Function that does the write. -> Builder              -- ^ Resulting 'Builder'. As you can see from this signature, we have some code here that some people would consider “not elegant”. Those people include me. However, we must not forget that efficiency is our main goal. Besides, these functions are not exported to the end user. So, that’s it for now. You can expect more updates from me in the feature, since I’ll be working on this project with great enthusiasm now that it has been accepted to Google Summer of Code 2010. Thanks to all the people who made this possible! This blogpost was partly based on the notes I make while developing. These can be found here. I’d also like to thank Simon Meier for his continuous stream of feedback.